Apple’s AirPods might be the most popular cord-free wireless earbuds in the world, but they’re hardly the only option out there. In fact, they weren’t even the first option out there. A bunch of companies made them, and they were all quite expensive. Then, once Apple joined the fray, about a million China-based companies hopped on board with cheaper options. 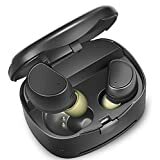 Of course, inexpensive doesn’t equate to low quality in this day and age, so you’ll find five different pairs of truly wireless earbuds below that are each available on Amazon for under $50. ✔Snap Pairing and Superior Connection Stability: the Bluetooth version 4.1 offers a hyper-stable connection within 10m/33 feet, compatible with all Bluetooth devices such as iPhone 7 / 7plus, 6 / 6s plus, S8, SE, Android cellphones, tablets or TV with bluetooth receiver. [Super Sound Quality with V4.1+EDR] Built-in A2DP /AVRCP Audio Processing System Which Eliminate Noise and Echo. High Quality Chip for Stereo Sound and Bass Sound .Clear High & Low Volume . It’s Easy To Take and Make Calls ,Voice Dialing with Superior Microphone Quality. Ideal for Car Calling and Friends Chatting, or Working Use. [Durable and Standby Time] Built in 40 mAh Lithium Polymer Battery , Enjoy about up to 3 Hours of Premium Quality Talk/Play Time (Full Charge approximately 1-2 hours), up to 40 hours standby time. 450mAh Capacity Charging Case Can Provide 3-4 Times Longer Charge by USB . [Ergonomic Design] Comfortable and Secure in-ear Earbuds ,Soft Material To Protect Ears, Make Your Phone Call and Music Time More Comfortable. Ear Hook Design Can Be Perfect for Sports, Jogging & Gym Exercise, Watching TV, or Sleep. [Compatible] Compatible with iPhone 7 6S 6 plus, LG G5 G4 G3, Samsung Galaxy S7 S6, Huawei, iPad , Bluetooth-enabled Tablets etc; the Wireless Range up to 10 meters. It Can Connect Two Mobile Phones at the Same Time and Ready to Answer the Incoming Call of one Phone at Any time. [After-sales Guarantee] Our Products have 18 moths Replacement Warranty and 100% Satisfaction Guarantee, If you are not Satisfied with your Purchase for Any Reason, Please Feel Free To Contact Us. 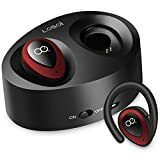 STEREO SOUND: High quality CSR chips, these earbuds deliver Hi-fi stereo crystal clear sound, great noise canceling effect, let you focus on your favorite music anywhere at anytime. Versatile TWINS: The headsets contain two pieces which can be used separately with someone sharing music or broadcast (within reasonable distance), or you can enjoy the stereo sound by using them both, or you can just leave one of them alone and enjoy the music world with just one earpiece. Pairing: Long press the power button of the pair of earphones at the same time until the led flash in blue and red alternately, then double press one of them, it is ready to pair and the led flash will be slowly in blue when connected. 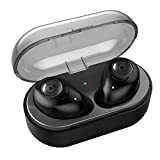 【Truly Wireless Earbuds】Wireless charging, wireless music listenning and wireless calls; fit nicely and unobtrusive in your ears, which makes you free from any cable mess. 【Recharge On The Go】Mini protable charging dock with metal contact, easy and convenient to recharge the earbuds anytime and anywhere. 【Stereo Mode/Mono Mode】Each earbud can work individually or in pair,wear one or both earbuds depending your own needs; Or you can pair 2 buds simultaneously to share one with others to enjoy the leisure time and the pleasure of music. 【Bluetooth 4.1+ CVC6.0】V4.1+ EDR ensure the strong and stable signal,fast paring and great compatibility; CVC 6.0 Noise allows you to enjoy the high quality and stereo audio quality. 【Ergonomic Design】Lightweight/in-Ear Design/Sweatproof so that the earbuds sits comfortably and snugly in your ears. REAL WIRELESS SEPARATE STEREO: Soundmoov 316T adpot TWS technology to make wireless synchronous connection stereo pairing come true. Without any cord troubles you can enjoy sports and music to the full. It has privacy call design, when you have hands-free calls only the main headphone (Left) can transfer voice signal. STORAGE BOX WITH CHARGING FUNCTION: equipped with mini and portable 450 mAh battery charging box, each ear plug 55 mAh, each earbud working time is 2 hours, two is 4 hours, the maximum volume of continuous call or listen to music for 2 hours to 4 hours, it is standby time of 120 hours. Do not worry about the lack of battery power, will not lose any call or stop music. 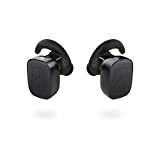 COMFORTABLE AND SECURE FIT: Soundmoov 316T is designed base on thousands people’s ear data, perfect angle and 3 sizes of ear cap, suit for most peoples’ ear, enjoy most comfortable, fitting, stable wear experience. WILD COMPATIBILITY: Compatible with iPhone 7 6S 6 plus, LG G5 G4 G3, ipod shuffle, ipod nano 7, Samsung Galaxy S7 S6, BlackBerry, HTC, iPad Pro, Bluetooth-enabled tablets;Perfect for Sports,Running,Jogging & Gym Exercise,Watching TV,or Sleep.